Each week, an estimated 1.3 million people move into cities. 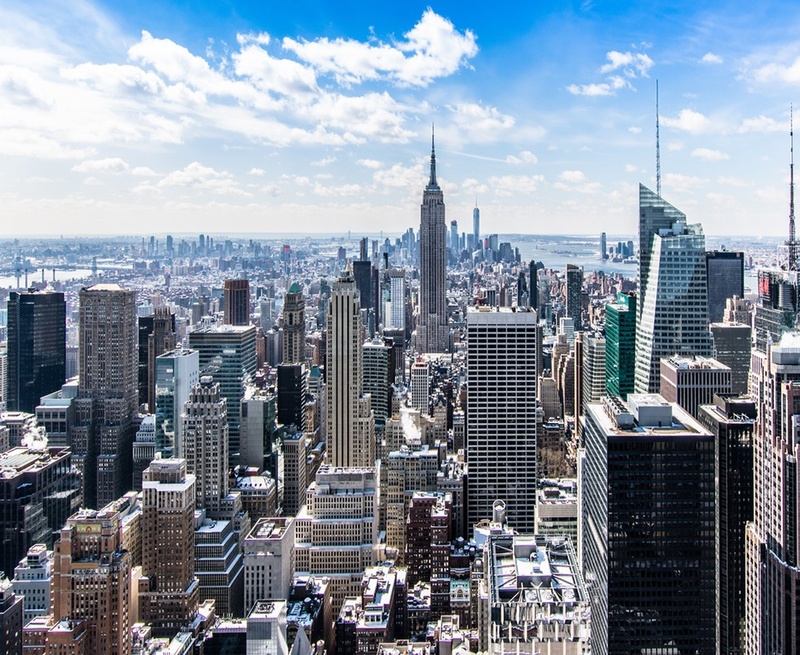 The United Nations states that, as of May 2018, 55% of the world’s population lives in urban areas, a number expected to increase to 68% by 2050. With so many people moving into more concentrated areas, there is an ever-increasing pressure on available resources, infrastructure, and services. According to a report by Juniper Research and Intel, this overcrowding is a major reason cities consider investing in smart city technology. By implementing connected, digital solutions, cities are able to deliver lasting and impactful results that improve quality of life for all citizens. The need for connectivity is increasing, and cities can’t implement Smart City initiatives alone. Budgets are tight, and with so many departments clamoring for more dollars, cities often don’t have the money to invest in digital solutions for the public. A survey of local governments from the International City/County Management Association (ICMA) found that availability of funding was the main barrier to implementing new practices, with 84.7% of respondents citing this as a significant or very significant factor. Plus, city governments often lack the specific skills required to implement new Internet of Things (IoT) technology or to maintain vast, ever-growing amounts of data. According to the same survey, 45.6% of respondents cited lack of information on how to proceed as a significant or very significant barrier, and 40.6% felt lack of internal expertise was a hindering factor. Operating partnerships: Public and private partners coordinate their activities, but do not make contractual arrangements. Advisory committees: Also called policy partnerships, this relationship between the public and private partners is focused on formulating public policy (for example, incorporating innovation into a highly-regulated industry). Project partnerships: Public and private partners share responsibilities, duties, costs, and benefits on one specific project. Strategic partnerships: multi-project partnerships, usually long-term in nature. Project partnerships and strategic partnerships may be organized in a membership model, through which partners join a nonprofit organization, a governing board is formed, and task forces complete the work. PPPs emphasize collaboration and cost efficiency, which helps to align public and private interests. They also relieve the government of some of the larger risks associated with implementing these new technologies, as well as management responsibilities. How will the rise of smart cities benefit businesses? According to a study by the Economist Intelligence Unit, 53% of executives say that smart city initiatives play a role in attracting and retaining top talent. Put simply, people want to live in smart cities. 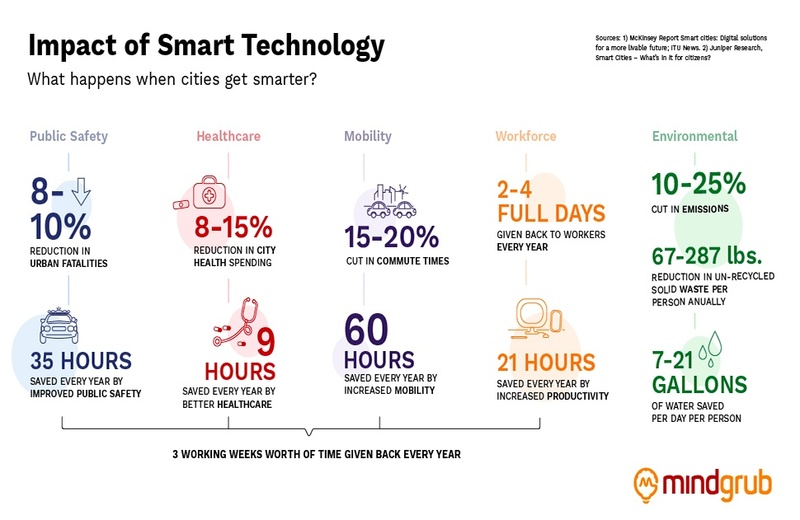 Smart city technology can improve quality of life, and cities with more connected education, workforce, transportation, and healthcare amenities will be able to attract and retain better talent. Of the executives surveyed, 46% of them feel implementing smart city tech will benefit their bottom line. “Because of ubiquitous connectivity, citizens are deciding on where to live based on livability and quality of life,” Rizwan Khaliq, IBM Global Public Sector’s Chief Marketing Officer. What sort of quality of life improvements can people expect? When viewed holistically, it’s been proven that new smart city technology could result in savings of up to 3 working weeks per year. Other possible benefits include the rise of smart buildings and office spaces. IoT-connected offices could see better security, increased productivity, and better sustainability. Connected buildings can help businesses optimize energy usage with apps that automatically adjust lighting and temperatures. Not only will this benefit the environment, but it will cut spending on utilities and increase favorability in the eyes of consumers. The 2017 Cone Communications CSR Study found that 63% of Americans are hopeful businesses will take the lead to drive social and environmental change moving forward, and 87% will purchase a product because a company advocated for an issue they cared about. Perhaps the biggest benefit of all to businesses is the economic impact of public connectivity initiatives. City governments will invest approximately $41 trillion in upgrading infrastructure with IoT. One study estimates that on average, a $1 increase in state CIO budgets is associated with a reduction of as much as $3.49 in state overall expenditures. What does a successful PPP look like? What started as a plan to replace 8,400 payphones has turned into a booming partnership that has created a wealth of new jobs, generated millions in ad revenue, and contributed to reducing the digital divide. In 2013, the city of New York awarded a contract to the CityBridge Consortium, a partnership including both Intersection and Qualcomm. With this partnership, they began replacing no-longer-needed payphones with digital kiosks. These kiosks, called Links, feature two, 55’’ HD digital screens, an Android tablet, a red 911 button, and free, high-speed wifi. Free services offered by each Link include phone calls, access to maps and information on city services, and device charging. The HD screens display public service announcements and advertisements, which generate revenue to support the maintenance of the kiosks themselves. What’s more, CityBridge pays for and operates the whole system at zero cost to the city and its taxpayers. 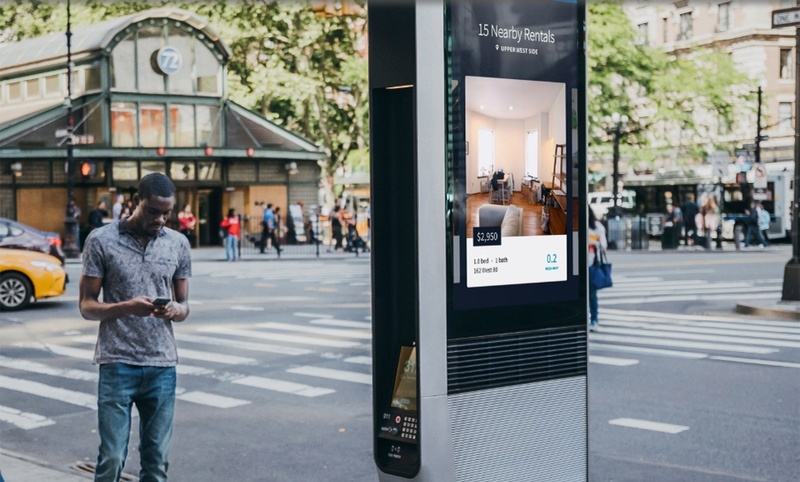 CityBridge supports the entire LinkNYC system with funds raised from advertising. Businesses that previously paid to advertise in phone booths can now pay to advertise on Links. The city will receive half (or $17.5 million, whichever is more) of the ad revenue each year. Once complete, there will be 7,500 Links in New York City, and the city predicts its ad revenue could reach $500 million in the first 12 years. Other cities, including London and Philadelphia, will soon have Links of their own, and several more are seeking to replicate this successful PPP. The Town of Cary, a suburb of Raleigh, NC, has been growing steadily since the 1970s. Conveniently located just outside Research Triangle Park, the largest research park in the country, Cary has made some very tech-savvy partners, and has been quietly overhauling its infrastructure with innovative technologies. Cary has taken a rather unique approach to smart city tech, which helped them become a Smart Cities Council’s 2018 Smart City Readiness Challenge winner. The town has turned its Town Hall campus into a “mini-city” and invited private-sector companies to come in and test their smart city solutions. The Town Hall campus includes a park, community center, police department, arts and history center, town hall building, and parking garage. This means Cary can test IoT solutions for smart parking, energy, utilities, public safety, traffic management, citizen engagement, and IT co-creation all from it’s Town Hall campus. This “mini-city” testing bed allows private companies to “be messy without interrupting citizen’s lives.” It also allows local subject matter experts the chance to help test out new ideas. Multiple technologies can be tested simultaneously, and once a solution is found, it can be implemented in the town right away. So what partnerships has the Town of Cary built? Trilliant, a global smart solutions provider, will be a leading partner in the Simulated Smart City project, alongside another Cary-based company, SAS. Trilliant plans to develop apps to help people find parking, to engage citizens, and to manage town facilities and events. Trilliant will also implement smart street lighting, free wifi, trash can sensors, and even Alexa™ to provide intelligent, personal assistant government services. Once these things are put into place, Trilliant will make the real-time data available to SAS, who will then enable analytics-based applications that improve safety and efficiency. This partnership between SAS and the Town of Cary is by no means new. For many years, SAS has been helping its hometown with data and analytics management. When Cary installed wireless water meters in 2010, it was suddenly flooded with data. The systems read 60,000 customers’ meters once an hour (up from once per month), amounting to 8,760 data points per person per year. With the help of SAS Analytics, Cary can now analyze half-a-billion data points, and make that information readily-available to customers. Armed with data, customers can quickly see if they have water-usage spikes or leaks, and can be alerted when water usage exceeds a preset amount. Plus, Cary can better understand how water is used, and identify issues anywhere in their network of pipes. In addition to managing water data, SAS is saving the town’s workers tons of time that would otherwise be spent on tedious research or data management tasks. SAS reporting and analytics features help the police understand crime patterns, help department heads manage budgets, and allow departments to track customer service efforts. Maybe your company isn’t the size of SAS, or you don’t have a neighboring city that’s willing to conduct smart city testing on its Town Hall campus. How can you both support and benefit from the opportunities inherent in smart city development? How do we need to adapt our current offerings? Consider how you can alter your current products or services to function in an IoT-connected city. Keep in mind, municipal governments have a lot of strain on their budget already. Can you team up with another company to provide even more value? How might smart cities shift value in our industry? IoT has completely reshaped the transportation industry with apps like Like Uber or Bird, through which you can request a ride or rent an electric scooter on-demand. What is the next opportunity for disruption? What does it take to be a successful smart cities provider? Consider the different types of public-private partnerships. Each city is unique, and will therefore require tailored smart city solutions. Sometimes selling your product or service directly to the city government may work, but other times a strategic, highly-involved partnership may be a better fit. Either way, companies will need to have a strong understanding of the city’s operating structure. Above all, if you really want to see smart city technology be successful in your city, get involved. Voice your support. Smart cities will benefit everyone, and they’re here to stay. Drop us a line if your business is interested in developing a new or advancing an existing digital service or product. Preparing for GDPR: How Will it Affect My U.S. Organization?